This post was inspired by the dessert table I did for my daughter’s recent shabby chic pumpkin first birthday. With Thanksgiving and Christmas around the corner, I put together a few new ways to present the traditional pumpkin pie. This is just a new spin on a classic. Prepared pumpkin pie – I simply mixed and baked the pumpkin pie based on the directions on the can of pumpkin puree. The only change is to omit the crust. Bake the pie filling in a greased pie dish without a crust. The three techniques I will show you are cracker style, push pop pie, and pie in a jar. For each technique I baked the crust before assembly. Let’s get started! Roll out the pie crust on a floured surface. Cut the dough into your desired shape. For the cracker style, I used a flower cutter and a round cutter around 1.5 to 2 inches in diameter. If you cut these too big, the flaky crust may not hold up to the topping. For the push pops, use the container to cut the crust circles. For the pie in a jar, use the canning jar ring to cut larger circles. Cracker Style: For the cracker style and push pops, lay out the crusts flat on a cookie sheet. For the pie in a jar, press the crust discs to the bottom and slightly up the sides of the jars. You will bake the crust in the jar. Prick the crusts with a fork. Bake the crusts at the recommended temperature but reduce the time. For me, the cracker and push pop crusts took about 8 minutes, but the jars took the full recommended time. Let the crusts cool. Fill your pastry bags fitted with large round tips with the baked pumpkin pie and Cool Whip. For the crackers, pipe a small dollop of pumpkin pie on the crust. Then top with Cool Whip. Pipe in the baked pumpkin pie and Cool Whip layers. Top with another crust disc. This one should fit just fine. Repeat pumpkin pie and Cool Whip layers ending with a nice swirl of Cool Whip. 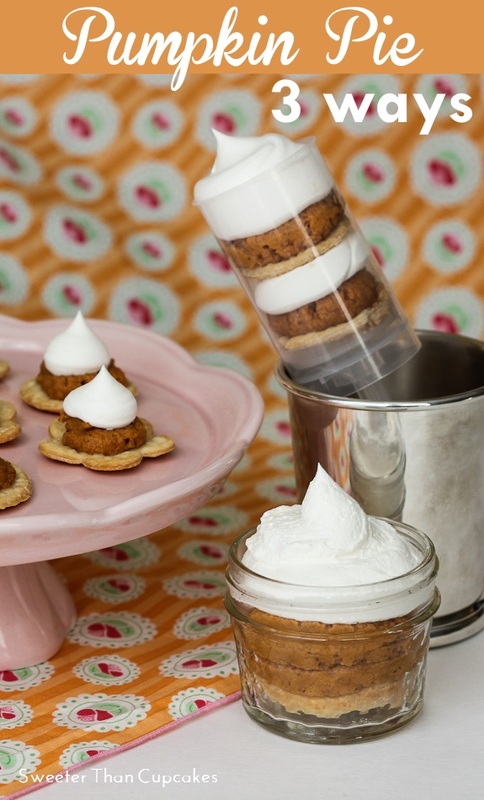 Pie in a Jar: For the pumpkin pie jar, pipe in a thick layer of the baked pumpkin pie, and top with a nice swirl of Cool Whip. Do one variation or all three. Either way, guest will be pleasantly surprised by a unique presentation. By the way, these help with portion control too! Most importantly, enjoy! Tip: Keep the Cool Whip piping bag chilled in between use. By the time I got to the pies in jars, my Cool Whip did not stay quite as smooth.